Although the main part of my trip doesn’t start until the middle of June, I had to take an earlier excursion to the newest of the Major League baseball stadiums – Hiram Bithorn Stadium in San Juan, Puerto Rico. With all of the financial problems that the Expos have had trying to maintain the fan support of their team in Montreal they (Major League Baseball) decided to generate extra revenue by playing 22 of their 81 home games in San Juan, Puerto Rico. Therefore, I wanted to make sure I went to Puerto Rico to see a few games, and why not schedule that trip when the Mets were playing. Yes, I am openly admitting to being a Mets fan from Queens, New York. And if you ask me “why?” The answer is simple, it is because my older brother Steve was a Met fan, and I am extremely loyal, so I’ve continued to support them through good times and bad, and to be sure, the Mets were really bad in Puerto Rico. So you will have to forgive me if at any point during my writing about this journey, I appear to show any bias towards the Mets or against the Yankees. Otherwise, you should know that I absolutely love baseball, whether it’s Little League, Independent Leagues, the Tigers, the Mets, or even the Yankees! This is similar to the itinerary included in a book I read by Brad Null & Dave Kaval called “The Summer That Saved Baseball”, which documented their journey to all 30 ballparks in 1998. This was a great book and helped me to formulate strategy for taking my own trip, but the one specific thing I want to do a little bit different is to spend a more time talking about the game I saw in each stadium. It may be a little bit strange to mention someone else’s book, when I plan to write a similar book about my own experiences, but It was a good book and helped me to get going. So now that I’ve laid out the framework, here goes with my story. San J uan is the only portion of my journey that required travel by means other than car or subway. I had to take a round trip flight from New York’s Kennedy Airport to San Juan, which was 1,597 miles each way (3,195 total). Puerto Rico is also the only U.S. Commonwealth that I will visit on my journey. I also had some company on this part of the trip as my friends Vinny and Tommy joined me. Another unique part of my trip to San Juan was that this is one of only two spots that I will be staying at a nice hotel (instead of the side of the road motels) – The Wyndham Condado Plaza Hotel and Casino. This was only due to the fact that I had assistance from Wyndham hotels, which thought it would be a great idea, if I could write about the place that the players would be staying in San Juan. They had no complaints from me! This hotel was definitely a great place to stay. There were three pools, a beach next to the pools, a few good restaurants, a casino, an incredible view of the waterfront, and most importantly, some very friendly and helpful staff. The players were actually staying at Wyndham’s El San Juan Hotel and Casino, which was close by. Now to be sure that those who know me so well understand how much I dislike to “Dress Up”, they will find it quite humorous that I could not get into the front door of the El San Juan. I didn’t even bring shoes or pants other than jeans and shorts, because I just had baseball and beach on my mind when I packed for my trip (and to boot, it was even too late to buy clothes)! My two friends, however, were smart enough to bring appropriate attire for late night activities. They went and had a great time gambling and cavorted with various players that were also enjoying the amenities of the El San Juan. Therefore, the bottom line is to make sure you stay at one of the two Wyndham Hotel’s when you go see the Expos play in Puerto Rico, but make sure you have appropriate attire to mingle with the players! OK, enough of the extracurricular stuff and back to baseball! If you take away the part about being upset at the Mets for being swept by the Expos, the experience at Hiram Bithorn stadium was incredible. The stadium is of minor league size, but is of Major League quality. 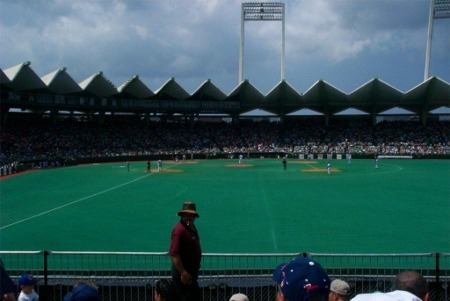 The stadium is named after the first Puerto Rican baseball player to make the major leagues back in the 1940s. His best season was in 1943 when he had a pitching record of 18-12 with a 2.60 ERA for the Cubs. Puerto Rico has honored him with a life size statue of him in front of the main entrance of the stadium. The stadium has a clamshell like appearance with the wavy white covering over the seats from right field all the way around to left field. The one negative to this stadium is that the game is played on artificial turf and the symmetrical stadium is relatively small with a distance of 315 feet down the lines, 360 feet in the gaps and 398 feet to dead center. The stadium only holds about 20,000 fans, but the view is good from any place in the park. Since we were going to three games, we wanted to make sure that we got a good perspective of the stadium by sitting in three different locations. The first game we sat in the more expensive ($65) seats down the left field line about 15 rows from the field, the second game we sat higher up behind home plate ($25) and for the third game, we sat in the bleachers for $10. The views were good from each spot, but we made the mistake of sitting in the bleachers for the day game in 95 degree whether, plus a decent amount of humidity as well. So of coarse I got a pretty good baseball tan/burn…you know, burnt knees, face, and arms so that when you take off your shirt you still look like you are wearing a T-shirt! My initial game-plane was a little thrown off when I first got to the stadium, because they did not sell scorecards or souvenir soda cups at the stadium, so I could not keep score or bring home my cup. They did, however, have a credit card promotion and the freebie was an Expos towel. Overall, the pickings for souvenirs were pretty slim. They sold hats and t-shirts commemorating the Expos playing in Puerto Rico by having both the Expos logo and the Puerto Rican flag on them, and they sold pictures of Roberto Alomar. They didn’t have t-shirts that would fit me (XL), and there was no way I was spending money to buy a picture of the Mets most disappointing acquisition, but I had to get something, so I bought the hat for $20 on day two (it was $15 on day one). 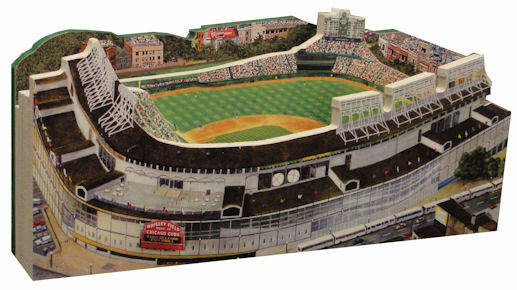 They had all of the food that is typical to U.S. ballparks, such as hot dogs, ice cream, soda, pretzels, pizza, and beer. In addition, they had some things that you don’t see everyday like vendors walking around the stadium selling Pina Coladas (which tasted real good) and stands selling straight liquor such as rum. In addition, they were selling crushed plantains that appeared to go over well with the crowd. I said appear, because somehow I did not notice this while I was there and did not find out about it until I got back to New York and read about it in the newspapers and heard about announcers (such as Tom Seaver) raving about how much they enjoyed it. The other thing that stood out to me was that even after the game was over, they were still selling beer! You just don’t see that in the U.S. ballparks anymore. The atmosphere of the game is what really won me over. The Puerto Rican fans really appeared to be ecstatic about having Major League baseball in their town. The almost sold-out crowds were yelling and screaming and having fun from beginning to end. Most people working at the stadium and in the stands spoke English, so communication was not a problem. In fact communication was great, because everyone was so happy and friendly. The interesting thing about the fans rooting interest was that you couldn’t tell if they were rooting for the Expos or the Mets. However, it was clear as day that they were rooting for the Puerto Rican players on each team such as Jose Vidro and Wil Cordero on the Expos and Roberto Alomar on the Mets. I loved how happy they were to root for their hometown heroes playing Major League Baseball at home for the first time in person. The only thing that made this difficult for me was that I couldn’t justify outwardly booing Alomar here like I do regularly at Shea Stadium! Now as promised, I have to talk about the actual games. 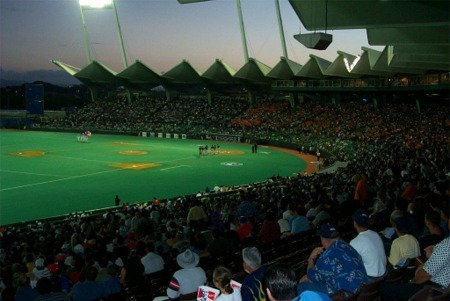 The game on Friday April 11th was the second Major League Baseball game ever played at Hiram Bithorn Stadium (and the first for the Expos at their second home), because the Rangers and Mariners opened up the season there in 2001. David Cone started for the Mets in his second appearance since coming out of retirement this year. He won his first game, but got absolutely battered around in the second inning of this game including giving up a grand slam to Brad Wilkerson in the process. Tomo Ohka, Scott Stewart and the Expos went on to win 10-0 while allowing only one hit (by Cliff Floyd) to the Mets in the process. I have to admit that I ended up going against my religion by being forced by my two friends to leave the game in the 7th inning to get a head start on enjoying the nightlife (I’ve already noted how badly that went for me). I absolutely abhor leaving a game early no matter what the score is at the time, but I wasn’t about to find a taxi on my own in a foreign place where not everyone speaks English. As it turns out, that would not have been a problem, but I did not know that at the time. In the second game, the Expos were once again victorious by the count of 5-4. My buddy Roberto Alomar’s (even though they didn’t officially give him any errors) and Mo Vaughn’s shoddy defense helped give the Expos three more runs than they deserved. It should be noted that the Expos poor defense, including two errors by First Baseman Jeff Liefer allowed three unearned runs as well. Livan Hernandez got the win and Jae Seo got the loss. The third game was much more exciting even though my Mets lost again, but this time it took them 10 innings to lose 2-1. The Mets had a 1-0 lead going into the bottom of the 9th inning, but Benitez gave up a Home Run to Orlando Cabrera to tie the game up. 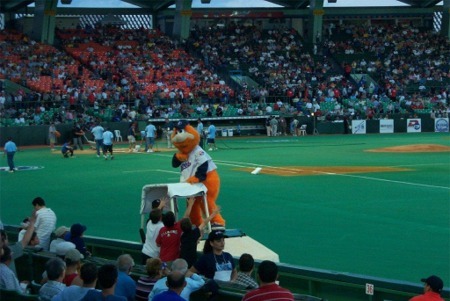 In the bottom of the 10th inning, the Puerto Rican fans got to go wild because Jose Vidro, one of the hometown favorites, won the game with a Home Run against Mike Stanton. Although the results weren’t the way I wanted them, I was still excited about how great this whole experience was for both me and the Puerto Rican people at the games. Overall, the Home team Expos won all three games, which isn’t what I was hoping for, but I wouldn’t trade the experience I had in Puerto Rico for anything. If you get the chance to go, do it. The people, the stadium and the atmosphere are all worth the trip!